So the other day I went gaga because I saw a Diamond Reo Trend. Take a guess what I saw today? A White Trend! Will wonders ever cease. This one didn’t have a camper but a stake bed and was lettered to resemble a dealership truck. It arrived on the back a trailer being pulled but mint condition White Construcktor. Mint! The Construcktor was also tasked with pulling one of the most iconic COE designs of all time, the White 3000. The 3000 sounded great with straight pipes but don’t take my word for it watch the video! It was awesome to see it take off down the track. And of course, the White Construcktor. Tomorrow I come home from the show and can finally start digging into the gigabytes of photos and videos from York. Hope you classic trucks, I’m going to be talking about this show for weeks. I found a few other shots of these trucks. 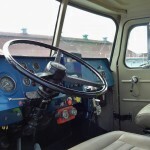 First, an interior cab shot of the Construcktor and second, a small group meeting. Also, the owner of the trucks, Russ, stopped by in the comments. Just in case you missed his comments. The 3000 is a barn find, with 40k original miles on it, still with paper on the seat corners from the factory, stickers and papers, etc. to validate its originality! I am the 2nd owner of the Construcktor. Really great truck, though it is the “poor man’s autocar”. Looks just like it rolled off the factory floor inside and out! 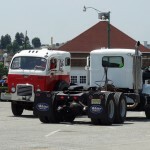 This entry was posted in Truck Show and tagged White 3000, white contrucktor, white trend. Bookmark the permalink. Great to see the photos and videos of my White trucks. The 3000 is a barn find, with 40k original miles on it, still with paper on the seat corners from the factory, stickers and papers, etc. to validate its originality!